This post is about all the career options I’d love to do when I’m older. All bookish, of course! I never really write very personal posts on my blog. However, I thought I’d write this, as it does quite largely link in to Why I Blog, too. The main reason I started a blog was because I liked sharing opinions on books and writing reviews, though I also thought it would be a good way of getting a little bit of work experience, too. Through blogging, I’ve gotten to meet lots of publicists and authors! I’ve always wanted to be a writer since… I can’t even remember when. 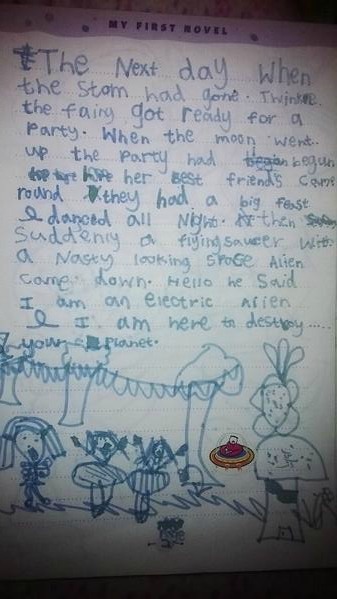 I still have the most embarrassing stories written from when I was younger… E.G., this thing about a fairy party with a gate-crashing alien. I still definitely want to be a writer! I’m actually writing a bit less frequently now, as I’m reading more and blogging more. Also, obviously, Twitter. Which I blame for all my procrastinating. Though, I have a short novella that I wrote for NaNoWriMo a while ago which I’m hoping to make longer and edit very soon- as well as a thriller I’m planning too. Through blogging, though, I’ve also had so many more ideas of jobs I’d love to do that are bookish. I write at least two reviews a week, and I really love doing it! I’ve found so many book magazines that I didn’t know existed- like Newbooks, and We Love This Book. I think it would be really fun to be a book critic for a magazine, too, or to be a journalist for a literary magazine of sorts! 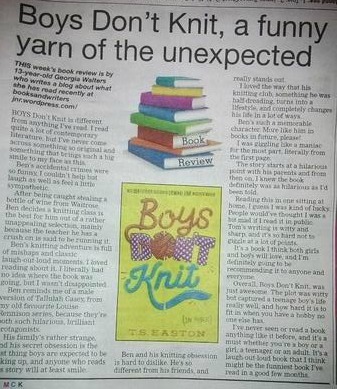 Thanks to Dad, I’ve started doing that, though not as a paid job yet… Most weeks, I have a little book review space in our local paper. It would be really great to do that for a living, right? Blogging’s the perfect experience for it, too! Lastly, I’d love to work in a publishing company- actually being a part of the process that gets books on the shelves in stores. I’d never actually considered it until I went to my first blogger’s event, which was at the Hot Key Books offices. That was one of the first times I got to meet people working in publishing, and see behind the scenes, in a way. I think that brunch was probably the decider for me! I got really interested in working as an editor, or in marketing and publicity… It seems like a really fun job! Or if not working on the content or spreading the word about a book, I’d really love to take part in designing book covers or illustrating books. I enjoy drawing a lot, and I like making things digitally- like the review-graphics I sometimes publish on here- even if that’s only fiddling around with photo editors I find online… Another link to Hot Key here- on their blog recently they’ve posted some design processes for their books. This one’s by Jan Bielecki, and goes through the design for Ellen Renner’s Tribute. And this post is about the illustrations by Isobel for the Isobel Journal. I really loved reading those, and they’ve gotten me even more interested about that kind of job! This entry was posted in Uncategorized and tagged art, blgoging, book critic, discussion post, journalism, marketing, publicity, publishing on March 3, 2014 by keithbwalters. Really interesting post – it’s surprising just how many bookish jobs there are! I feel you completely! I’ve wanted to have a bookish career, myself. It was always author when I was younger, but now I’d really like to go into publishing or something. Designing covers would be awesome too! Not sure if I’d be good at that one or not, though. I wish you much success! definitely, haha! 🙂 And you to! Thanks for the comment.